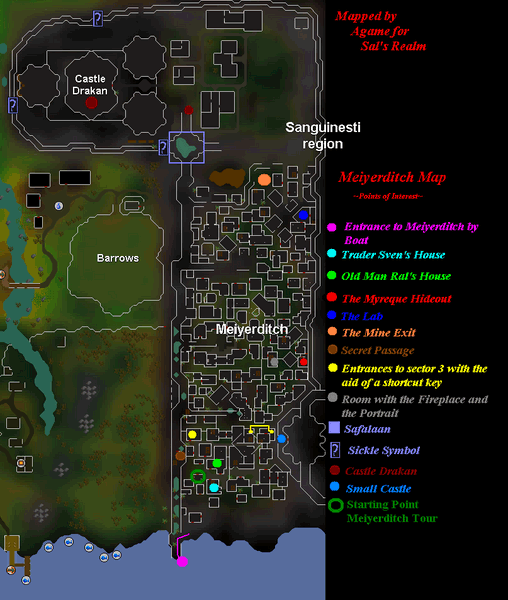 Meiyerditch is the largest city of Runescape, located east of the Barrows. It gives home to a wide selection of interesting NPC's, including the legendary Drakan Family, which makes it the capital of Morytania. It's mainly used during the Darkness of Hallowvale quest, but it's always interesting to make a small trip, even if it's just to visit the mighty Drakan Castle or buy a set of Vyrewatch Clothes. Before lord Drakan invaded the city, it was called Hallowvale, and it was only inhabited by humans. Nowadays, the humans still live there, but under poor conditions and they are forced to give weekly blood tithes to the mighty Vyrewatch who patrol the city. But there's still hope for the unfortunate people of Meiyerditch, since the Myreque seek to destroy the Drakan Family. If you want to make the best out of your trip to Meiyerditch, make sure to have completed the Darkness of Hallowvale Quest. This guide is written so it can easily be used along with the quest. The only way to get in Meiyerditch, is to board a small boat in the south-eastern part of Burgh De Rott. If you haven't started the Darkness of Hallowvale yet, you'll first have to start it and then you can repair it by using a plank on the boat and a plank on the boat chute. You'll of course also need nails and a hammer to do this. The planks can be purchased in Mort'ton or made by the Sawmill Operator. When you've repaired the boat and pushed it down the cute, board it and off you go! You'll now be in the wall. Just walk a bit north until you reach a pile of rubble and climb over it. You have now arrived in Meiyerditch. Trader Sven owns the only shop in all of Meiyerditch. The only thing he sells though, are clothes which can be very interesting if you want to move trough Meiyerditch more safely, or if you just need a fancy outfit. 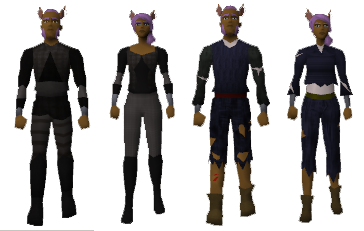 If you are wearing a Vyrewatch or Citizen outfit, you reduce the chance of getting noticed by the Vyrewatch. A full set of Vyrewatch clothes cost 1950gp and gives a +6 Defence bonus against slash and crush attacks, the pieces separately cost 650gp each. A full set of Citizen clothes costs 18gp and gives a +6 Defence bonus against slash and crush attacks, the pieces separately cost 6gp each. 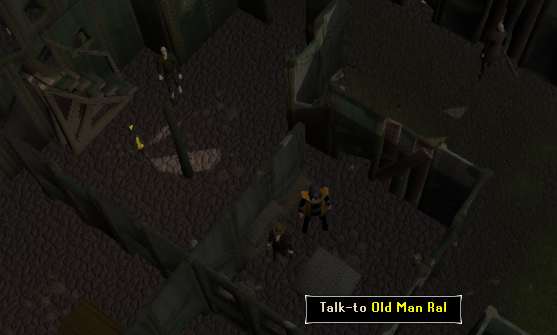 Old Man Ral is mainly used during the Darkness of Hallowvale Quest. After you've completed it you can still go to him for a 'friendly' chat and to get some free papyrus. The secret location of the Myreque (a.k.a. the Sanguinesti Order) is located underneath a house in the eastern part of Meiyerditch. The way to get there is explained below, in the 'Getting Around' section. The only two (known) Myreque members who are active in Meiyerditch, are Safalaan (the leader) and Vertida Sefalatis (his partner). During the quest, they can provide you with helpful information about the Myreque, but afterwards they only congratulate you with your new function in the Myreque order. After a certain point in the quest, you can also get free papyrus from a crate near them. The lab is also located in a secret basement underneath a house (lots of secret rooms here). 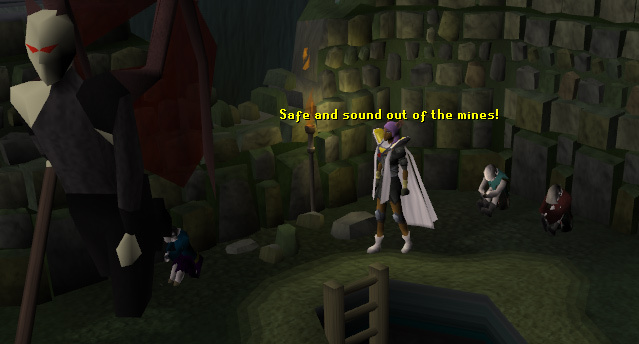 The fastest way to get there, is by attracting the attention of a Vyrewatch and letting him send you to the mines. When you leave those again, you'll be located near the lab. 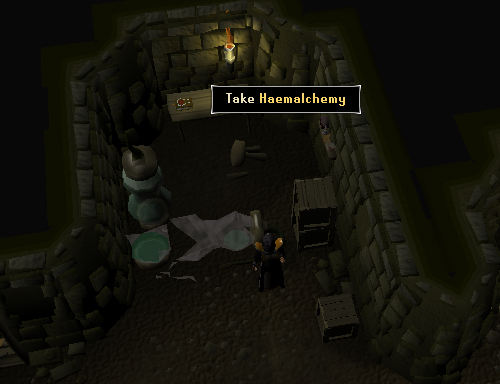 There is also a small book in there, called Haemalchemy, it is only used during the Darkness of Hallowvale quest. 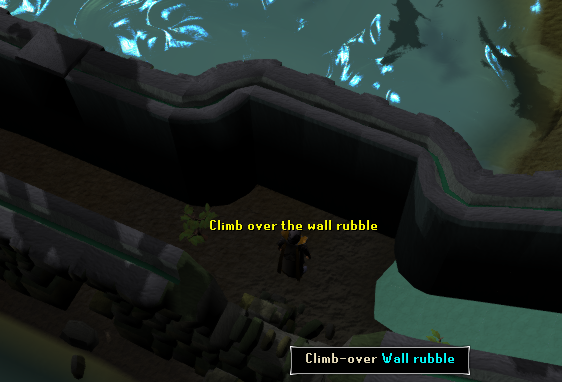 It's blocked off by a fallen tube, but you can telegrab it with the runes you can get from the Broken Runecase. Once you took them out, the case will be empty and you can't get any more runes. 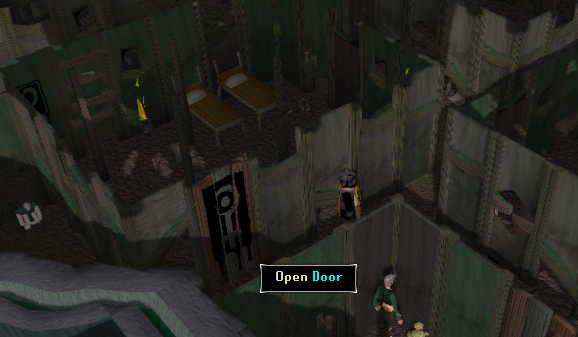 There is also a mysterious door which can't be opened and there's nothing behind it. Perhaps it'll be unlocked in a sequel to Darkness of Hallowvale? 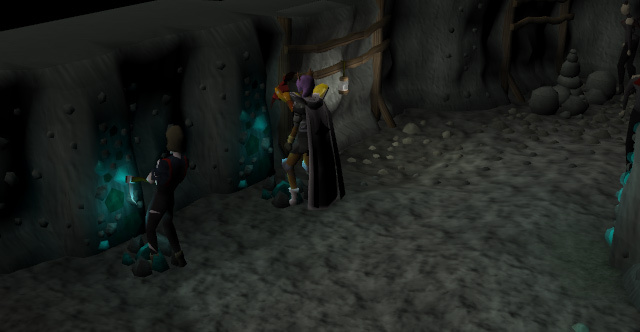 After a certain point in the Darkness of Hallowvale quest, you'll get the option to get sent to the mines, if you pull the attention of a Vyrewatch. You'll get teleported to a small mine with some very tired miners and a few level 54 Juvinate Guards who can't be killed. 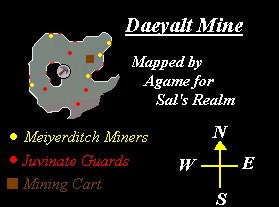 If you want to get out of the mine, you'll have to mine 15 Daeyalt ores. It may be possible that you haven't brought your pickaxe, so you can always ask one of the miners to borrow you one (don't get thrilled, it's only a bronze pick). When you have the ores, you can deposit them in the mining cart in the eastern part of the mine. You don't have to deposit all 15 ores at once if you don't have enough inventory space. When you've filled the cart, just talk to one of the guards to get out of the mines. 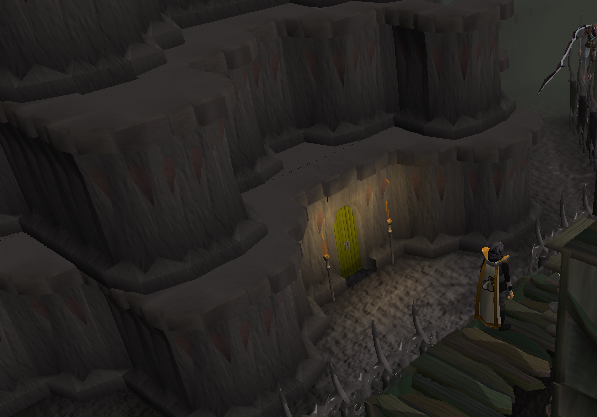 You can of course stay down there to powermine, each piece of Daeyalt gives 17xp and you only need level 20 mining. When you've left the mine, the lab is only a few houses south. 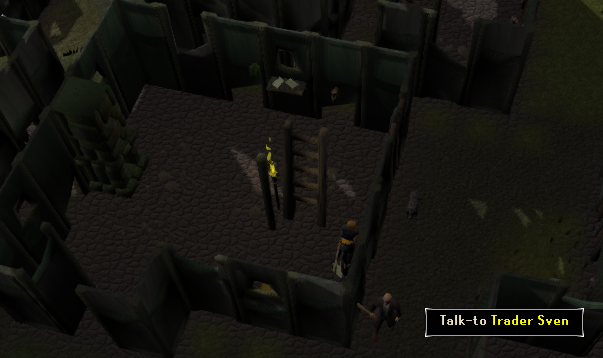 You can't get back into the mine via the exit, if you want to go back you'll just have to hope for a Vyrewatch to show up. 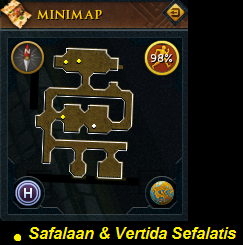 At a certain point in the Darkness of Hallowvale Quest, Vertida Sefalatis will tell you how to get trough the secret passage in the Western Wall of Meiyerditch. This way you can get to Safalaan or to Castle Drakan. 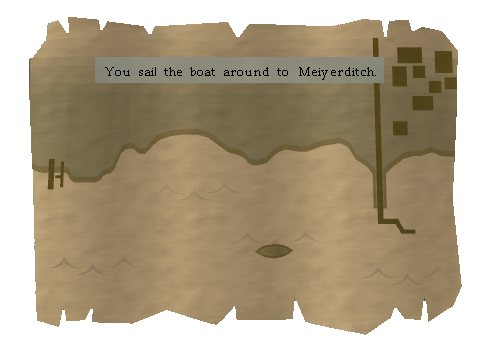 First you get back to the point where you entered Meiyerditch, the collapsed floor near your boat. But instead of going down the floor, you just continue walking north until you reach a ladder. Climb down and there you are. 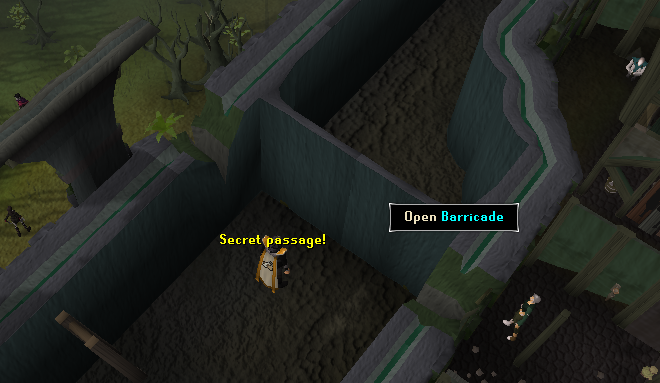 Welcome to the secret Passage! 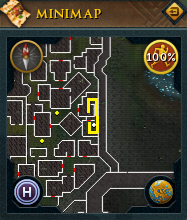 When you've finished the Darkness of Hallowvale Quest, you'll get a Shortcut Key from Safalaan. This key can be attached to your key-ring (from the One Small Favour Quest) and is very handy if you want to travel trough Meiyerditch. If you use it properly, it can save you a lot of time. 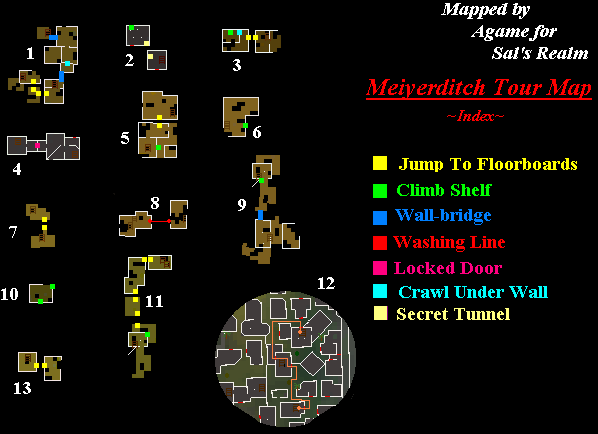 Use your key to open it and to skip 8 steps of the Meiyerditch Tour Plan (shown below in the 'Getting Around' section). You'll now be located in step 2 of the map shown below. Continue the tour until you get to step 4, where you go out the door and walk to the next house on your east side, use the key on the door, get in, climb the ladder and you'll now be at step 9. This room is only used in the Darkness of Hallowvale Quest, when you need to deliver a (love) message from Sarius Guile, Vanescula's servant, to Safalaan. 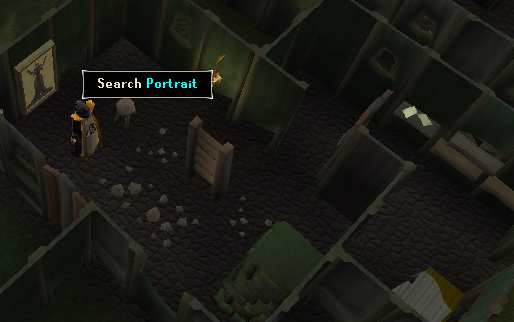 You also pass trough this room when you are using the Meiyerditch tour to get to the Myreque Headquarters. This is the place where Safalaan will be if you haven't sketched Castle Draken yet, again, all this happens in the Darkness of Hallowvale Quest. To get there, you'll need to go trough the Secret Passage (shown above). Just search the odd markings on the wall, go trough the passage and start walking north till you see a ladder. Go up, and continue north till you find yet another ladder. Get up, walk north and go down the next ladder. Precede your journey till you find Safalaan. Note: When you are walking over the wall, you'll face a lot of Vyrewatches, so the chance of getting detected is pretty big. 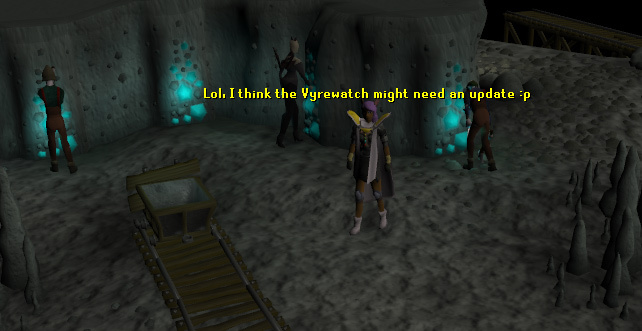 Wear a Vyrewatch outfit to avoid most of them. The Sickle Symbols are drawn by the Myreque, so you can easily draw sketches of Castle Drakan during the Darkness of Hallowvale Quest. If you want to take some nice pictures of Castle Drakan, you can go stand on those spots since they will provide the most interesting view. 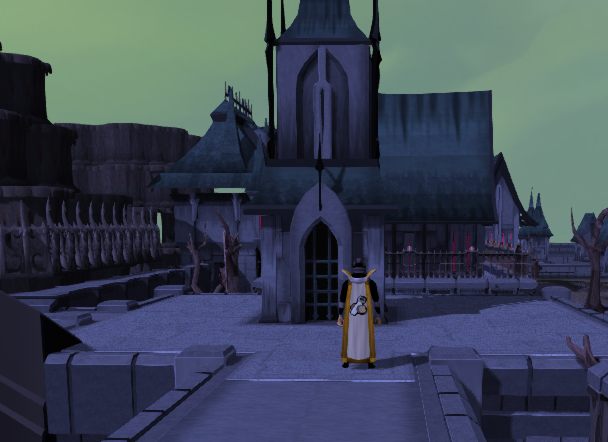 The biggest castle in Runescape, Castle Drakan, ruling spot of Morytania and home to the Drakan Family. The closest you can get to it, are the surrounding walls. The only use to the players it has now, is in the Darkness of Hallowvale Quest. In the eastern part of Meiyerditch lies another small castle without any use. It's surrounded by level 45 Vampyre Juveniles and level 54 Vampyre Juvinates. Getting around in Meiyerditch is not as easy as it sounds. 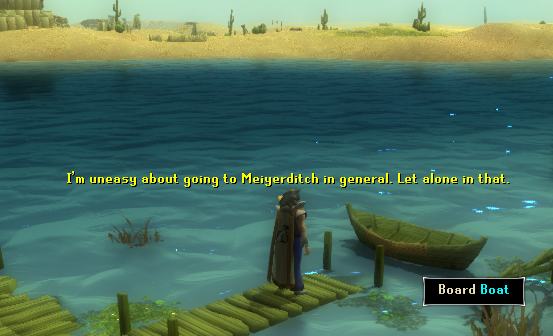 You can get lost by making one mistake which will force you to teleport and having to make the trip trough the Morytania Swamps all over again. Here's a map which shows the route to get to the Myreque Headquarters, the pictures are taken from the minimap, so you'll have to use that to navigate. Underneath the map is a detailed text which explains how to get trough, step by step. The numbers next to the pictures match with the numbers next to the explaining texts. Along the tour, you might find Sickle Symbols on the walls, these are made by the Myreque to guide you to their Hideout. So you can always use these to check you're going the right way. To start the tour, go to the house that's indicated in a green circle on the city map. It's the house just west of Trader Sven. You can recognize it by the Sickle Symbol next to the door. Climb up the ladder to get started. Once you've climbed the ladder, you'll find yourself on the middle floor of the house (obvious). Now just jump to the southern floorboards, and then do the same to the east. 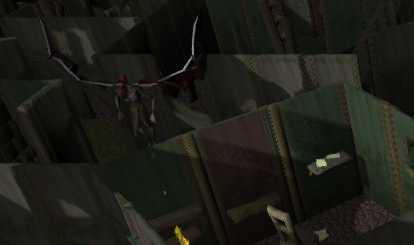 Walk a bit north till you get to a collapsed wall, (if you haven't done Darkness of Hallowvale yet, it'll still be up and you'll have to push it over.) Walk over it and crawl trough the hole in the wall. Continue north and walk east over another collapsed wall. Climb down the ladder. When you've climbed down the ladder, you'll be back at the ground floor. Against the western wall there'll be a secret tunnel underneath a small table (if you haven't completed Darkness of Hallowvale you'll have to toss it over first). Go through the tunnel and you'll be in another house. If you look at the door, you can see that you are in the same house that can be entered with the aid of a Shortcut Key. Now just climb up the shelf at the northern wall. When you've climbed up the shelf, you'll be back at the middle floor. Now climb trough the hole in the eastern wall and then jump east on the floorboard of the neighboring house. Climb down the ladder. Now you're back at the ground floor. Walk east until you get to a door, (if you haven't finished Darkness of Hallowvale, the door will be locked and you'll have to search the pots next to it to find a key.) Proceed to the eastern room of the house. Key: Now, if you have a Shortcut Key, you can leave the house to the north and walk to the neighbouring house in the east with the aid of your Key. If you haven't got one, just climb up the ladder. You'll end up at the middle floor from the northern house at step 5 on the map. Now you just jump south to the floorboards of the southern house. Walk out of the room you are in to the east and then south till you reach a shelf. Climb up the shelf. You're now at the top floor of the house, climb up the ladder west of the shelf. Welcome to the roof of the house, jump south at the neighbouring house's floorboard and climb down the ladder. Now you're back at the top floor, you'll see a washing line hanging out of the eastern wall. Walk over it to get to the neighbouring house. Climb down the ladder. 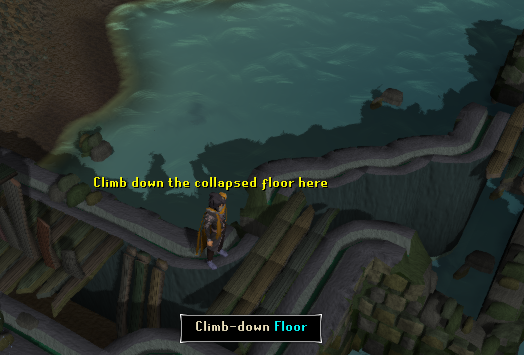 Now you're back at the middle floor, head north to a collapsed wall and walk over it. Continue north till you get to a shelf. Climb up. Key: For the owners of a Shortcut Key, if you used your key in step 4, you'll be on the ground floor of this house, climb up the ladder, and up the shelf to continue your tour. Your stay at the top floor won't be long, just climb down the shelf at the north-eastern corner. Walk a bit north and then jump to the floorboards of the neighbouring house. Walk a bit north and jump again. Continue north and jump east to another small building. Climb down the ladder, you'll be back at the ground floor. You're now back at the ground floor of the house. Leave trough the door (I've you've done all correctly, it'll be at the eastern wall) and start heading north. Go into the Room with the Fireplace and the Portrait (shown on the top map) via the eastern door and leave the house via the northern one. Keep heading north till reach a house and turn to the east. Now enter the first southern door you see and you'll be in a large house with a ladder (take a good look at the picture to prevent yourself from going into the wrong house). Climb up the ladder. Now, if you got all this right, you're almost there. Just jump east via the floorboards and go down the stairs. Take a turn west when you get back at the ground floor and walk south till you reach a wall. Search it and it'll open. Now you'll be in a room with a very large rug. Search the odd marking on the northern wall, and you'll hear a click. Now you can open a trapdoor in the rug. Congratulations! You made it to the Myreque Hideout! The Drakan Family is a very mysterious yet powerful group of Vampyres who rule over Morytania from their fearsome castle in Meiyerditch. The only two members of the Drakan Family who ever were seen in the game, are Ranis and Vanescula Drakan, the son and daughter of Lord Lowerniel Vergidiyad Drakan. Lord Drakan himself is told to be so horrifying, his visage can never be truly captured on a picture. When the Drakans came to Gielinor with the Mahjarrat, they rebelled along with Zamorak to defeat Zaros. Almost immediately after that, they wanted to invade the rest of Runescape and started forming a grand army of werewolves, vampires and vampyres. 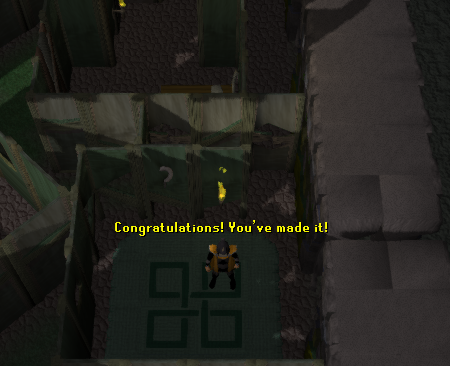 But the Seven Priests of Saradomin forced them back, which caused their own death. By this, Drakan couldn't reach the other side of the Salve anymore, since the river got blessed. Instead of trying to push forward, Drakan pulled back and invaded Hallowvale (only Burgh De Rott and Meiyerditch are the remains of this city). The powerful Icyene Queen Efaritay stood up against him, but had to stop this because Lord Drakan kidnapped her husband. Most of the citizens fled to the Paterdomus temple, but a part of them still remains in Burgh De Rott and Meiyerditch. The evil Lord forces these people to give weekly blood tithes to feed his army. Until now the city of Mort'ton, a small trading community, was left unharmed by Drakan, but one day a cloud of Evil Air reached the town and turned it's citizens into zombie-like creatures. Shades also start appearing. The inhabitants of Port Phasmatys foresee that Drakan will try to conquer them too and call for the aid of the priest, Necrovarus. Drakan is unable to attack them, but the citizens die and remain trapped in this world. Count Draynor, the brother of Lord Drakan, leaves Morytania but gets very weakened by the River Salve. He resides in Draynor Manor where he gets weaker and weaker since he's no longer under Drakan's protection. A brave vampire slayer comes forward to kill Draynor, which makes Drakan furious. Now he seeks to destroy the Myreque, who want to do the same with him. Drakan sent a Vampyre, Vanstrom Clause to kill them, but failed due to the same brave adventurer who stopped the attack (wait till he faces Drakan...). This adventurer also avoided the death of Ivan Strom, one of the Myreque members, by killing two Vampyre Juvinates. However Drakan seems to take a break in his castle now, he is still plotting the downfall of Runescape, starting with those meddling Myreque and their adventurer. Firstly, Vampyres should not be confused with Vampires, since those are animals driven by their lust for blood. Vampyres are very intelligent and sophisticated. None of the Vampyres who remain within Meiyerditch can be killed, since they are protected by the powers of Lord Drakan! So better leave your wooden stake at home. There are currently 4 forms of Vampyres. The Juveniles, the Juvinates, the Vyrewatches and the Full Vampyre. Juveniles are the weakest form of Vampyres, who only just got their transformation from Human to Immortal. Juvinates are the more advanced form of Juveniles. They are much stronger and already have some special powers. Vyrewatches are the second most powerful ones, they already have wings, large spears and dark powers. They also patrol Meiyerditch to collect blood tithes from the people there. When you're walking trough the town, you might be stopped by a Vyrewatch to give a blood tithe, which deals 6 damage. You can also try to distract them (if you want to continue your way, always to this, you've got nothing to lose), if you fail at this the Vyrewatch will just take a blood tithe, just give the blood tithe or get use for combat practice. If you choose the last option you should run, since you cannot kill them! 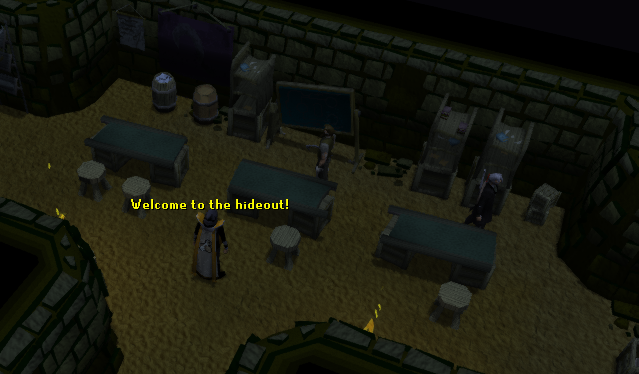 When you've visited the Myreque Hideout for the first time, the combat option will be replaced by the 'send me to the mines option' which can come in handy if you want to go to the Lab. Note: None of the Vampyres are aggressive, so don't be afraid of getting attacked by them. 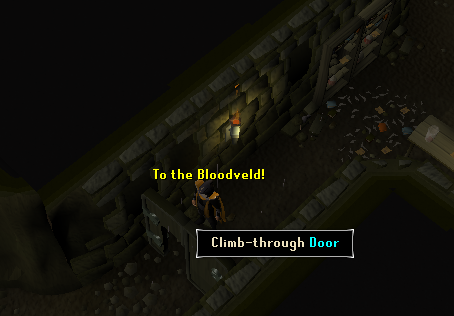 The full Vyrewatch has never truly showed their powers in the game, but at their full strength, they can control darkness, corrupt ones mind and draw the blood from your body without even touching you (according to the Postbag Letters). Apparently they can also not be harmed by any weapon. But probably a good pour of blessed Salve water would make them squeak differently. Of course it's not all misery, starving people and Vampyres in Meiyerditch. You can also unlock some funky tunes whilst roaming trough the narrow streets. These are the people who live in Meiyerditch and the monsters who lurk around. 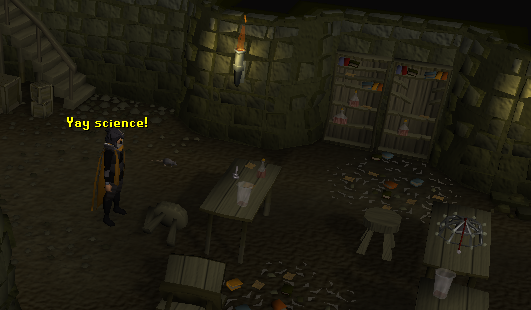 Since the Vampyres can't be killed in Meiyerditch, they are included with the non-attackable NPC's. If you brought your Amulet of Catspeak, you can have a heartbreaking conversation with the cats of Meiyerditch.